Mizhav or mizhavu one of the oldest percussion instruments is an integral part of the performing temple arts of Kerala like Koothu, Koottiyattam and Nangiar Koothu. 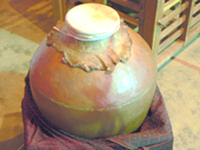 A large pot-shaped vessel made of copper or clay with the mouth covered with stretched hide, this instrument is unique in producing a vibrant tone enriched with classical rhythm and purity. Considered as a 'Brahmachari' (a Sanskrit word meaning one who observes the vow of brahmacharya), this sacred instrument was allowed to be played only by a person from the Ambalavasi Nambiar Community, Chakkiyar and the Nangiars. It used to be a central part of all the solemn ceremonies like 'Annaprasanam' (first feeding of the baby), 'Namakaranam' (Naming ceremony), and other customary Hindu rites. There is a traditional decree that if the 'Mizhavu' became dented or damaged after some period then some solemn rites had to be observed. Repair and reusing this sacred instrument is not allowed. In the olden days mizhavu was made out of clay, but these days it is mostly made of copper. It's narrow mouth is covered tightly with leather. It is usually placed inside a wooden frame called 'mizhavana'. The player strikes the hide with his bare hands to produce rhythmic notes. Though it is used as an accompaniment to the performing temple arts of Kerala, it's deep and majestic sound makes it ideal for solo percussion symphony also. One of the talented exponents of this instrument is Kalamandalam Iswaran Unni, the head of the mizhavu department at Kalamandalam, a center for Performing Arts and Culture in Cheruthuruthy, Trichur district, Kerala.